Whether you are considering a re-roofing project on a home, business, or large shed, getting up on top of the roof with a ladder and tape measure is not the ideal way to find out how much material you will need to get for the replacement roof. Not only is this a dangerous maneuver but it is certainly not going to give you an accurate form of measurement. Instead, because your roof is a significant investment in both money and time, the best way to get the estimate you need is through mathematics and the handy-dandy use of a roofing calculator. Here is a step-by-step guide on how to get the roof area and the roof pitch, so you can input these numbers into a calculator to get the total rough estimate of how much it is going to cost for a new roof installation. By doing this, you will have a much easier time figuring out the roof pitch and the roof surface areas. The best way to go about this by getting the longest dimension of the roof. A good thing to remember is that one roof square is equal to 100 square feet. Count how many squares there are and take that number and convert it into the measurement units you want to use for your drawing. Take note of things like valleys, diagonal distances, protrusions, overhangs, dormers, and hips as these will need their own measurements. Chimneys, vents, skylights, trim, and even pipes all affect the surface area of the roof. You may need to use binoculars to count out the squares of shingles in places that are unreachable. Sketch these areas out onto your roof diagram before moving onto the next step. The pitch of a roof is the angle that it sits at and how steep it is. The pitch of the roof is the measurement of the vertical rise divided by the horizontal span, often measured out in inches. You may hear a roof’s pitch is compared to the slope, but they are not one in the same. The reason the roof’s pitch must be calculated before the area is because it affects the actual area size of the roof. A moderately pitched roof will run as a 6 in 12 where the roof will rise six inches vertically for every twelve inches of horizontal run. If you have a steep roof, you may have a 12 in 12 where your roof is at a forty-five-degree angle. 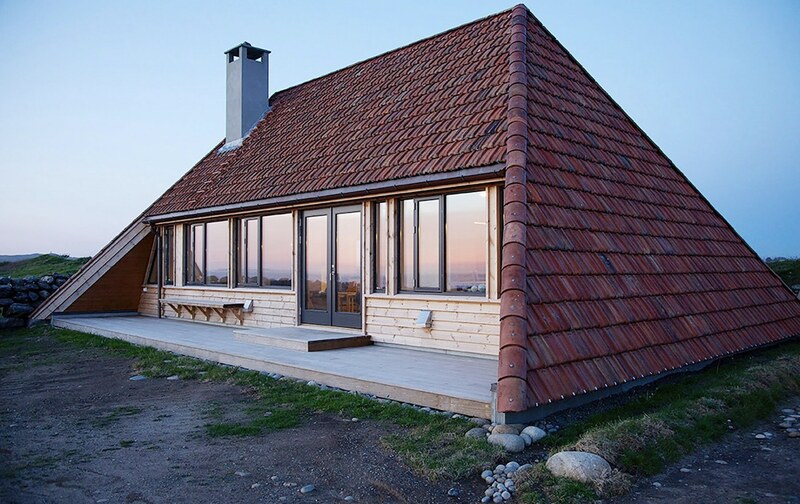 The rise of the roof is the distance from the top studded wall to the peak of the roof, while the run is the distance from the outside edge of the perimeter of the studded wall to the center of the house. There are three ways by which you can measure your roof’s pitch. Grab a ladder and place a level a foot or so up on the roof and hold. Measure the 12-inch mark from the bottom of the level down onto the roof. If this distance measures at four then you have a 4 in 12, or if it measures at 8, you have an 8 in 12 pitch. Grab a ladder and jump up at the end of your house where the gable is. Place the level on the gable trim, flat against the house. Measure from the 12-inch mark on the level up to the bottom edge of the gable’s trim. The distance you get is the roof’s rise. If you have an attic, you can place the level against one of the rafters and mark where the 12-inch mark is on the bottom of the rafter. Measure from the end of the level up to the bottom edge, and this will give you the roof’s rise. The most common roof is a 6 in 12, which is a 27-degree angle with anything above this being anywhere between 30 and 45 degrees. Anything below a 6 in 12 is anywhere from a 5 to 23-degree angle. There are a few ways you can go about this, but typically the easiest way is to calculate the simple areas of the roof and then calculate the more complex areas. You can do this by finding out the estimated amount of how many shingles you will need. Measure out the length and width of each plane on your roof, including things like hips, dormers, and adjacent pitches. Multiply the length by the width to get the square footage of each plane. To give an example of what you would do for a shed is simply multiply the length and width of one plane but for a gable roof, which has two planes, you would measure both planes and add the totals to get the total square footage. Do not forget to factor in the slope factor, take away recessed areas, and calculate gable lengths. Once you have the roof size in square feet (or in length times width as feet), the roof pitch, and the material you want your shingle to be, you can use a roofing calculator to get the total square feet of the roof area, the number of squares it has, and what the range of the installation cost will be. The average 1,700 square foot roof will have a roof area of around 1,901 square feet with twenty squares, and an installation cost of anywhere between $7,224 to $14,300. However, this is dependent on what time of materials you want to use during the installation. For instance, asphalt shingles, steel shingles, aluminum shingles, Galvanium/Aluminum seams will all have different cost ranges. It is important to keep in mind that the materials being used in the installation will only account for about forty percent of the cost, while labor will make up the rest. If the roof you have is large or requires specialized skills in metalworking, then the installation cost will be higher. A roofing calculator will be able to give you a good idea of the approximate amount needed to get your roof replaced, however, if you want a pinpoint accurate amount, you will need to hire a professional assessment.